Our Building and Pest Inspection Ascot customers tell us one of the most daunting feelings of buying a house is the fear of the unknown. Certified Home Inspections is here to help take that feeling away by completing a thorough Building and Pest Inspection. Once you call through we handle seeking access to the property for the Inspection through the Real Estate Agency. We try to make Building & Pest Inspections run as smooth as possible and it's one less thing you have to deal with. Australian Standards state that a visual inspection is all that is required by the Industry. At Certified Home Inspections we want to look further and have invested heavily in Advanced Equipment. All our teams are made up of one Qld Licensed Builder and one Timber Pest Inspector, both Certified for Pre Purchase Building and Pest Inspections. The classic "Two heads are better than one" saying has never been more true. Our Twin Home Inspectors go through the property in different directions and tip each other off to areas of concern. We pride ourselves on the fact our business is completely paperless. This speeds up efficiency (In the office and out in the field) which means we can get the reports to you a lot faster. The secret is in our digital Building and Pest Inspection report which is completed onsite and includes photos of all the areas of concern. Each Inspection Report is quickly sent back to the office where they are quality control checked and then sent off to you. The average time it takes to have the reports in your email inbox is four hours. This really is an advantage especially when you find a last minute auction and need every thing fast. We are here to help make things easier. If Active Termites or previous termite damage is found then we strongly recommend a further evasive inspection. After gaining written consent from the vendors we can place our borescope into the wall through a series of 10mm holes and have a much better insight to the extent of activity or damage. This minimises the guess work and can possibly show where the termites gained entry. If we locate active termites we can arrange a fast onsite quote to treat the Termites and to further protect the house with a Termite Barrier. For best results we advise to disturb the termites as little as possible. The Termite Treatment is completed by the same Timber Pest Inspector that originally inspected the property. We use a chemical called Termidor which is safe for family and pets. It has a unique transfer effect where the termites pass it onto one another through communication and grooming. 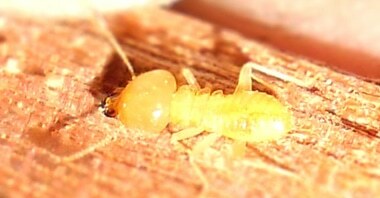 Termite Treatments are completed to the highest standard and have warranties in place. From there you can further protect the property with a Termite Barrier. This all depends on the construction type, dampness of the soil and gardens/plants which surround the house. Not all homes need a barrier and our Pest Inspector can explain how you rate of the Termite Risk Factor. We also offer a Pest Control Service on settlement so you can move into your house pest free. This is the best time to do it as the place is unfurnished and can remain closed up for a day or two. 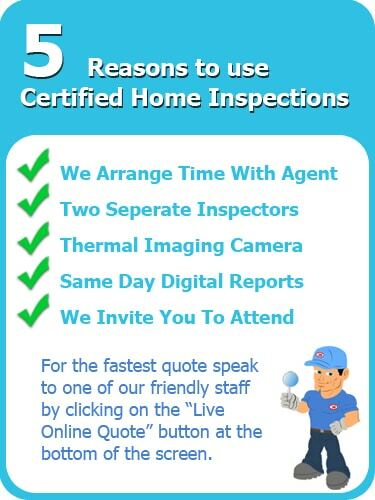 So if you are buying a house or selling one and in Ascot and need an honest and thorough Building and Pest Inspection, think of Certified Home Inspections. Free Thermal Camera Imaging Done On Every Inspection. Fast, Same Day Reports. Simply fill in our Fast Quote Form or Live Chat one of our Building and Pest Inspection Ascot team by pressing on the "Instant Quote!" at the bottom of the screen to find your Building and Pest Inspection Cost. Compare Our Quote To Save.